"My brother Joey was part of the first Special Olympics Games in Chicago in 1968. The excitement and pride that he received from that experience changed his life. He always wore his recent received medals for everyone to see and of course to congratulate him." The Gold Medal Circle giving club honors individuals who enrich our athletes’ lives with generous support not associated with an event by contributing $1,000 or more each year to sponsor athletes. The distinguished donors marked with an asterisk (*) are also members of the Honorary Coaches Club and contribute $10,000 or more per year to sponsor our athletes. For more information, contact Violette Prentice at vprentice@sosc.org or 562.502.1143. In the Olympic tradition of excellence and grandeur, The Champion's Society® members are the guardians who protect our athletes' future. By providing for Special Olympics Southern California (SOSC) in their estate and financial plans today, members of The Champion's Society® guarantee the long-term success of SOSC and its athletes. We would like to recognize these individuals and families for their generous support. For more information on including Special Olympics Southern California in your future plans please contact Violette Prentice via email at vprentice@sosc.org or call 565.025.1143. Special Olympics Southern California gratefully acknowledges the generous support of the following foundations, trusts and specialized funds that supported our athletes. For more information, please contact Melissa Wickman at mwickman@sosc.org or 562.502.1098. Special Olympics Southern California enriches lives, and your generosity helps to provide training, uniforms, equipment, travel and countless other resources to our athletes. The donations enhance the experience and help leave a lasting impression for those supported. We work hard to maximize your investment. 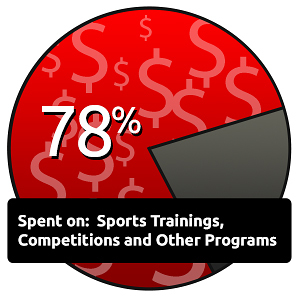 For every $1 raised on behalf of our athletes, 90 cents goes directly to program costs.